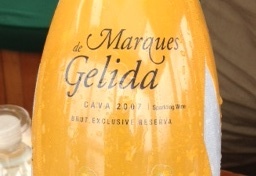 Marques Gelida Exclusive Cava Reserve, Penendes, Spain, 2007. This third wine in our afternoon still showed its individuality and engendered smiles among all tasting it. This entry was posted in Cava and tagged Spain.